Legally Blonde is one of the most well-loved romantic comedies of our generation, but Reese Witherspoon has revealed that it has done more than just entertain audiences; it has also inspired careers. In a new interview, the actress explained that women frequently tell her how the film prompted them to go to law school. 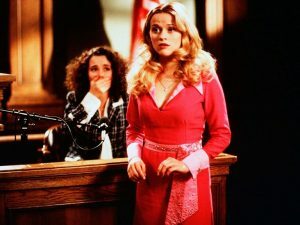 “At least once a week I have a woman come up to say to me and say, ‘I went to law school because of [the film]’,” Witherspoon told The Wall Street Journal. If you haven’t seen the movie, Legally Blonde follows the life of Elle Woods, an extremely perky blonde who tries to win back her boyfriend by following him to Harvard Law School. While it is not the most realistic of storylines, it doesn’t actually come as a huge surprise that the movie has impacted upon the careers of fans. A recent study by Fletchers Solicitors found that 39 per cent of millennials’ careers were inspired by TV shows.